Following a judicial clerkship for the Honorable Richard A. Schell of the United States District Court for the Eastern District of Texas, Sherman Division, Jodie entered private practice in Dallas where she has established a track record of success in a wide variety of legal matters. 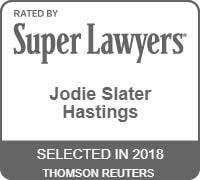 Jodie’s trial practice includes representations in federal and state courts involving commercial disputes, bankruptcy litigation, intellectual property disputes, consumer disputes, and labor and employment matters. Jodie also regularly counsels clients on how to resolve matters outside of court. Represented business owner in trademark dispute with co-owner of trademark. Defended clients against civil RICO and fraud claims. The Deepwater Horizon Oil Spill and Multidistrict Litigation: What to Expect, What Remains Unknown. Co-authored with Brant C. Martin. consolidation of litigation stemming from the Deepwater Horizon oil disaster. WEST BANKRUPTCY CHAPTER. Contributor for post-confirmation litigation section.